Hawaii's favorite son was in action last night at Blaisdell Centre in Honolulu as Brian Viloria came up with a decision over iron-chinned Mexican challenger Jesus Iribe in a firefight to retain the IBF light flyweight title. Iribe came into the bout as the reigning WBC fecombox titlist and had gone 12 rounds in a losing cause against top man in the division, Edgar Sosa, but "Azul" from Culiacan was the decided underdog in this title challenge. Cheered on by a heavily partisan audience, Honolulu born Viloria came out and, as expected, gave the visitor a boxing lesson over the first half of the contest. 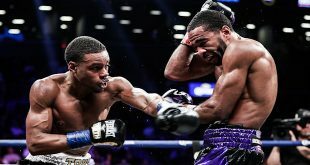 Viloria aired out his complete arsenal over the first six rounds in a fine display of skill, but Iribe showed true grit and determination to ride it out. 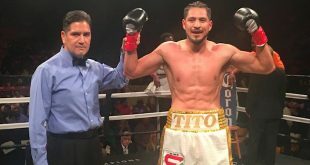 That got a bit harder to do as Iribe was hurt from huge shots from Viloria in the fifth and six rounds, but the Mexican veteran rolled on. As Viloria started to tire in the seventh, Iribe came on and began to trade on even terms with the IBF champion over the next two frames. The tenth saw the biggest action so far as both men were hurt at different times amid the fierce, two-way shelling. 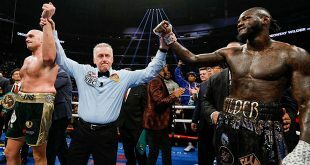 The eleventh saw the pair take a step back to regroup but everything went out the window in the twelfth and final frame as the fighters unleashed all the ammo in an attempt to KO the other. When the smoke cleared, both men were still on their feet and Viloria retained the IBF belt by scores of 118-112, 117-112 and 117-111. The "Hawaiian Punch" goes to 26-2 (15) while Iribe drops to 15-6-5 (9) after a valiant effort. On the undercard, big punching 20 year old Filipino southpaw AJ Banal, 20-1-1 (16), outboxed Mexican campaigner Jose Angel Beranza, 32-15-2 (25), over ten rounds at super bantamweight. Durable Beranza had stunned Ivan Hernandez in 2006 and Vernie Torres in 2007 before ruining the unblemished records of previously unbeaten prospects Jesus Rojas and Juan Carlos Velasquez over the last nine months but was unable to upset the odds against "Bazooka" Bernal.